Director Christopher Nolan concludes the trilogy that turned "nah-nah nah-nah nah-nah nah-nah Batman!" into "yes-yes yes-yes yes-yes yes-yes Batman!" 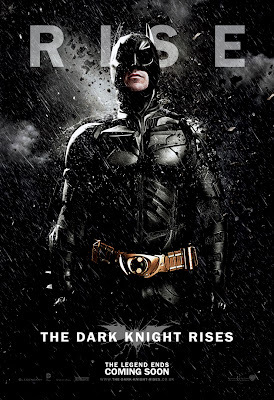 The Dark Knight Rises picks up 8 years after the events of The Dark Knight; Gotham City is plagued with the threat of a new villain; the terrorist Bane (Tom Hardy). As Gotham sees its darkest hour, Bruce Wayne (Christian Bale) goes against his word and dons his bat-suit once again to become Batman - the city's Dark Knight - in order to face his greatest challenge yet. Coming in at around 2 hours and 45 minutes, The Dark Knight Rises is a very, very long film - and at times it doesn't half feel like it! In the wake of 2008's The Dark Knight and all of Nolan's other cinematic greats there was an almost unbeatable amount of anticipation for this film, and from that perspective there was a slight feeling of disappointment for me at least. By the end of the film the main plot did feel rather simple (and strangely reminiscent of one scene from 1966's Batman: The Movie in many respects - never thought I'd say that!) for a Nolan film - from which you'd usually come to expect a lot more than what is on the surface - and for someone who has seen all of Nolan's other films was expecting a bit more. Tom Hardy is the Bane of Batman's (Christian Bale) life in The Dark Knight Rises. 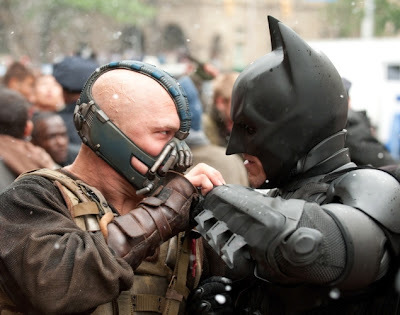 Well written and beautifully shot by Christopher Nolan and his excellent team (a special tip of the hat must be made to Director of Photography Wally Pfister), The Dark Knight Rises is an intelligent blockbuster that twists and turns repeatedly, keeping you guessing and double guessing right through to the very end. This is the beauty of a Nolan film - that regardless of however complex or not the story may be, it is always presented in such a way that it is constantly disillusioning you until the very last piece of puzzle comes into place right at the end of the film. Nolan is both a master storyteller and filmmaker who knows how the two work together and how they can be manipulated and developed in order to create the best result that will last with the audience. Whilst I correctly predicted how the film would end even before seeing it, there wasn't one moment where the film didn't force me to doubt myself as to how it would get there, and constantly throughout the film I was still being surprised with each choice that was made. The ending itself without spoiling anything is done perfectly as to allow everyone to feel satisfied with the film's conclusion (hopefully you'll understand what I'm talking about if you've seen it - you can't imagine how difficult it is to write this spoiler-free!). Christian Bale leads an incredible cast with an excellent returning performance as Bruce Wayne/Batman which pushes the character to the very limits unlike anything seen in either of the other two films. Tom Hardy's Bane presents an incredible villain figure who many people may not recognise (his only film appearance was as a minor grunting bodyguard type role in Batman and Robin - the film that almost killed the Batman franchise before Nolan saved it), but one that no-one will forget. 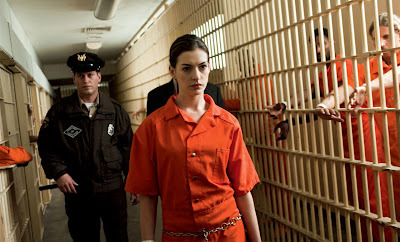 Anne Hathaway naturally has a large role in the film playing Selina Kyle/Catwoman, a screen presence so spectacular that she steals a lot of the scenes. Whilst some people were concerned about Catwoman's presence, rest assured that she is presented purr-fectly (couldn't resist!) in this film with Nolan challenging her good/bad identity unlike any of the other films that feature her. The supporting cast of both old and new faces is also fantastic and helps to make the film - although discussing some particular individuals best be avoided in order to steer clear of spoiler territories. 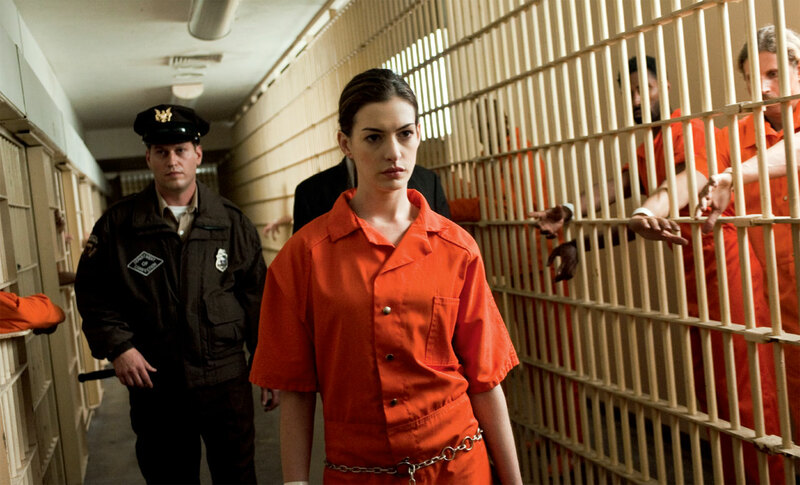 Selina Kyle/Catwoman (Anne Hathaway) experiences some time behind bars, probably for stealing all the scenes in The Dark Knight Rises. Christopher Nolan has successfully achieved exactly what he set out to do with this film; his intentions were to create a finale that completes Bruce Wayne and Batman's story established in the previous two films, closing off many other unfinished storylines at the same time. For anyone who hasn't seen Batman Begins or The Dark Knight (seriously!? Why the hell haven't you!?) you can still watch and enjoy this film - you will however understand and appreciate it slightly more if you have seen these films, as above all else this is a finale. Whilst The Dark Knight remains as the best stand alone Batman film, The Dark Knight Rises is a film that completes Nolan's incredible trilogy, cementing it in history as one of the best film trilogies of all time. It more than deserves to be seen and recognised as a grand finale over a stand alone film. 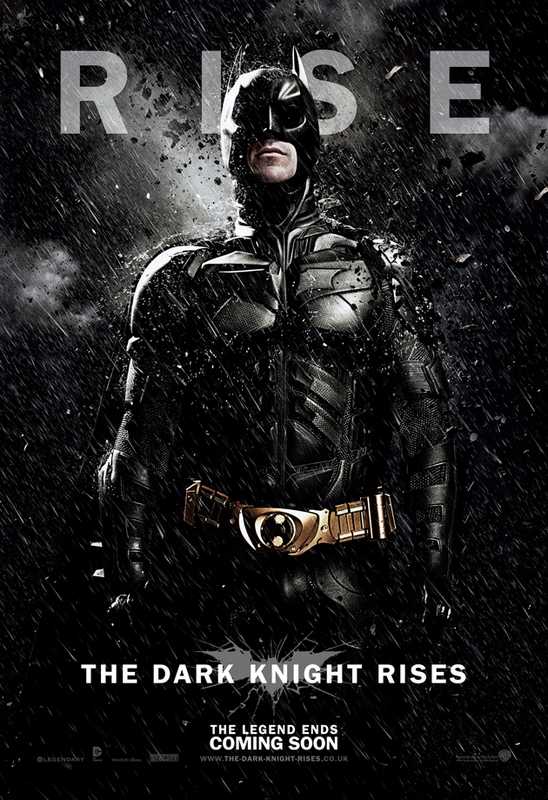 The Dark Knight Rises is now showing in cinemas across the UK. Have you seen it? Agree or Disagree? Leave your comments below! Labels: Batman, Christopher Nolan, DC, IMAX, Oscars, Review, The Dark Knight Rises, Warner Bros.
Beautiful review. I don't know how you managed to review without giving away any spoilers, but you did it! Anyone in doubt about seeing this film should read this review, then immediately get an Imax cinema ticket. Fantastic review. Can't wait to read more. When it was all said and done, I stood up, clapped, whipped some tears away from my eyes, and smiled by how happy I was with what Nolan gave us for the last time. What a way to end a great trilogy and it doesn’t get any better. Great review Dave.